Create a pricing DID batch for reseller. Create a pricing DID batch for customer. When working with large numbers of DID numbers and providing them to customers, it is desirable to provision them as quickly as possible to keep the cash flow going. A great way to achieve this goal is to use resellers which will thereby boost your sales. 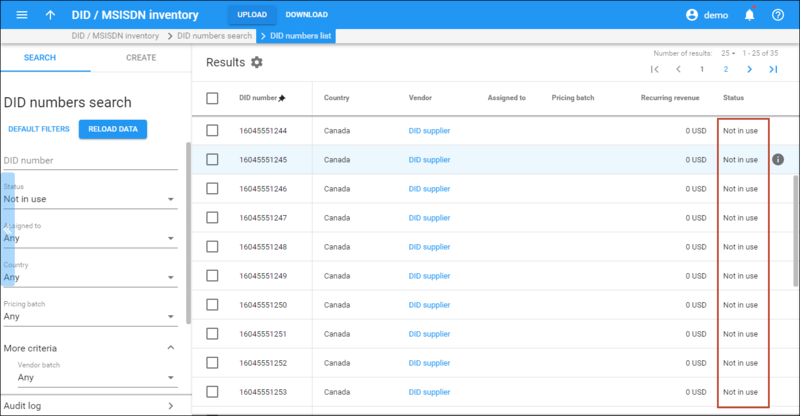 This chapter demonstrates how to enable resellers to provision large numbers of phone numbers (DIDs) using the DID inventory. You, as the residential VoIP service provider, have acquired a pool of Canadian DID numbers and want to provision them to customers within the month. Therefore, you cooperate with your reseller, ABC Shuttle, and permit them to access your pool of DIDs to further provision the DID numbers to their customers. The sections below provide detailed instructions for how to configure DID provisioning for resellers. Create a product for the reseller use. The reseller will be able to sell this product to end users; make sure this product is marked as Managed by: Reseller. Please refer to the Create a DID Supplier Vendor, Create a DID Batch for the Vendor and Upload DID Numbers sections of the Managing Available Phone Numbers (DID Inventory) handbook for detailed instructions on how to upload DID numbers. Upon upload, the status of DIDs is Frozen. When they are frozen, they are stored in the DID inventory and are therefore unavailable for immediate usage. To allow resellers to use the uploaded DID numbers it is necessary to release the DID numbers to the DID pool. NOTE: DID numbers cannot be released to the pool if they are used as an account ID, account alias, or an access number. Therefore, you must first delete an alias / access number or rename the account ID before a DID number release. 1. On the navigation menu to the left, select Infrastructure, Inventory and click DID inventory. 2. On the DID inventory panel, select Vendor batches. 3. On the Vendor batches search panel, type in the specific vendor batch and click Apply filters. 4. Click the Number of DIDs. 5. On the Results panel, select the appropriate DIDs and click Manage. 6. In the Select operations to apply to the selected DIDs dialog, select Pool management, then select Release DIDs to the pool. Click the Apply button. On the refreshed screen you will see that the DID numbers have now been unfrozen and released to the DID pool with the “Not in use” status. 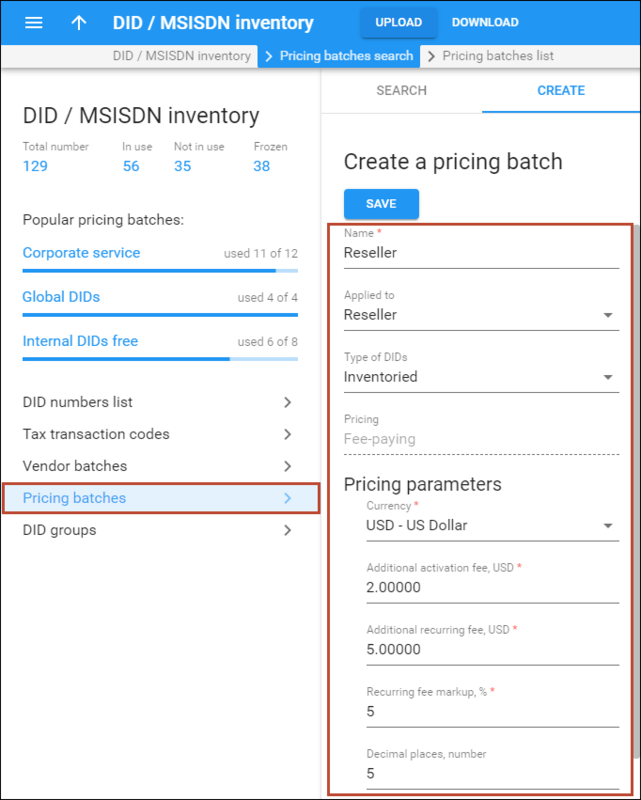 Pricing batches allow you to apply additional charges to your resellers for provisioning and using the DID numbers. At this step it is required to create a pricing batch with the DID markup. · Applied to – Select Reseller. o Additional activation fee – Specify an amount you want to charge in addition to a DID provider’s activation fee. o Additional recurring fee – Specify an amount that is always included in the recurring (e.g. monthly) charge. o Recurring fee markup – Specify a markup that will be included in the recurring amount charged to the reseller in addition to the actual DID cost (charged by a DID vendor). · Decimal places, number – Specify the rounding pattern to obtain “marketable” figures. This will specify the last “pre-set” digits in the figure. Please refer to the PortaBilling® Help for a detailed description of the available fields. To enable reseller to access the DID pool for further DID provisioning and apply charges to the reseller for DID number usage you need to first assign the pricing DID batch to that reseller. To allow a reseller to provide services to his customers and apply charges to them for service usage it is required to create a product for the reseller’s use. 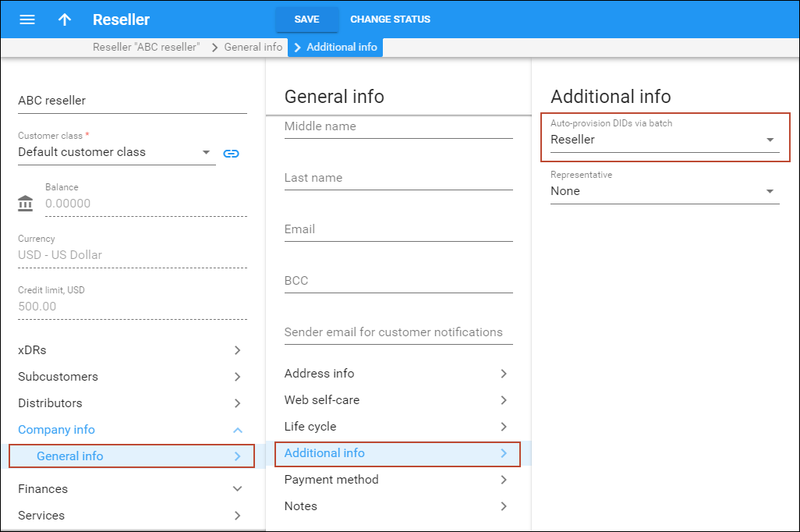 Please refer to the Create a Product for the Reseller section of the Configuring a Reseller for Postpaid Services handbook. Open the reseller self-care page in a browser (by default: https://<your-porta-billing-server-name>:8442) and log in with the credentials that were provided to you. NOTE: Sometimes administrators click the Logout button on the admin interface and then log in using the reseller’s username and password. This will not work since they are still in the admin realm, to which your reseller does not have access. You should append the 8442 port to log in from the reseller self-care interface. A pricing batch contains DID numbers that will be provided to customers by the reseller. The DID markup defined within a pricing batch allows you to apply additional charges to customers for using the DID numbers. At this step it is necessary to create a pricing batch for customers and define the DID markup within it. 1. In the Networking section of the reseller interface, choose DID Inventory. 3. Press Add to add a new batch. 4. Type in the batch name and click the Pricing Parameters link. 5. Define the currency for the DID markup and fill in the Pricing Parameters form. Please refer to PortaBilling® Help for a detailed description of available fields. 7. Click the Save button in the toolbar, or the Save icon on the left end of the row. 8. Repeat steps 1-7 to create other pricing batches with different DID markups within them. Now it is required to assign some DID numbers to the pricing batch. When the DID numbers from this batch are provisioned to customers, the customers are charged according to the pricing parameters defined within the pricing batch. 2. Select NONE (Unassigned) from the Pricing Batch list and click Search. On the refreshed screen you will see the pool of available DID numbers. 3. Select the individual DIDs or, alternatively, use the First N option to automatically process a large number of DIDs at once. 4. Choose the Assign Pricing DID Batch option and select the pricing batch created above. 5. Click the Apply button. On the refreshed screen you will see that DIDs have been assigned to the pricing batch. TIP: If you have accidentally assigned a wrong DID number to a pricing batch, you can release it back to the DID pool. To do this, select the NONE (Clear DID’s Pricing Batch) action. 1. In the Participants section of the reseller’s web interface choose Customers. 2. Fill in the Add Customer form. o Customer ID – Short name for the customer object; this will be used on the web interface. o Customer Class – By default, your customer class will be applied. This means that all invoicing and payment collection parameters that are defined will be applicable to this customer. o Balance Control - Specify the way the customer will pay for the service: Postpaid – after consuming the services; Prepaid – prior to consuming the services. Choose Postpaid in this field. o Currency – The currency in which this customer will be billed. o Permanent Credit Limit – assign a credit limit for the customer. o Email – An email address for the distribution of accounting information. After the billing period is over, a list of xDRs and other statistics will be sent to this address. o Time Zone – The time zone for the customer self-care interface. o Web Interface Language – Language to be used on the customer self-care web interface. o Send Statistics – Summary only – Deliver a call summary only and do not attach a details file; this could be useful in the case of a large number of calls. Other options are Full Statistics (attach a complete list of xDRs) or Do not send (this option prevents the delivery of event statistics to this customer via email). o Suspend On Insufficient Funds For Subscriptions – Specify whether the system should check that the customer has sufficient funds for his / her subscription charges. o Billing Time Zone – Time zone in which customer’s billing period will be closed and invoices will be generated. o Billing Period – Frequency of invoice generation. For more details about the different available billing periods, see the PortaBilling Administrator Guide. - As a percentage (e.g. 90%). The warning will be sent when the customer’s balance exceeds that percentage of his credit limit. So, if the credit limit is USD 1000.00 and the threshold is 90%, a warning will be sent as soon as the balance exceeds USD 900.00. This is only applicable when the customer has a positive credit limit. - As an absolute value. The warning will be sent as soon as the balance goes above the specified value. NOTE: To specify several credit limit warning thresholds, enter the values, separated by commas. 1. While on the Edit Customer page, go to the Additional Info tab. 2. Select the previously created pricing DID batch in the Auto-provision DIDs via Batch list. 1. Go to the Customers screen. It should resemble the screenshot below. 2. Next to the customer name, click on the Accounts icon (the one in the Accounts column) to go to the account management page for that customer. 3. Click on the Add icon. o Account Role – The defined usage for this account. Select Phone line from the list. o Main Product – Assign the main product you want this account to have. o In the DID Number Select dialog box, you will see the list of available DID numbers and the charges associated with them. 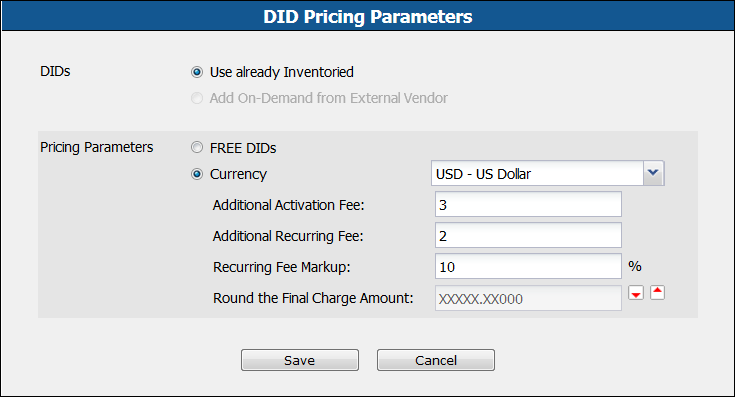 The charges for DIDs from the DID pool are pre-populated from the customer’s pricing batch. o Click the DID number link to select it as the account ID. o Type – Account type; select credit for postpaid and debit for prepaid service. o Service Password – Together with the account ID, this password will be used to authenticate registrations and call attempts on the SIP server. It is very important to assign a secure (difficult to guess) password to prevent the account from being wrongfully entered and used to inject fraudulent calls to your network. o Email – Enter the account owner’s email address here. If he ever forgets his password for the web self-care pages, he will be able to reset it, and a new password will be sent to this email address. You can also just leave this field empty. o Batch – A batch is typically used to manage large quantities of one customer’s accounts, so it can be left empty for residential VoIP service – in other words, the account created will not be tied to any specific batch. o Main Product – Choose the main product, which you would like your account to have. o Add-on Products - Assign add-on products to the account, if required. o Auto-Provisioning – Leave None (manual provisioning) selected. o Specific Date – Identifies the date that the account expires. Since we are setting up a postpaid service, which should function for a long time, leave this field blank. o ____days after First Use – Defines the number of days the account remains active after its first use or recharge. Since we are setting up a postpaid service, which should function for a long time, leave this field blank. o ____days after Last Use – Defines the number of days the account remains active after its last use or recharge. Since we are setting up a postpaid service, which should function for a long time, leave this field blank. o Login – Account login to web self-care pages. Can be the same as account ID. o Password – Password for the web self-care pages. o Time Zone – When an account owner (SIP services subscriber) accesses web self-care pages to see a list of his calls, we can show the time in the time zone most appropriate for him. o Web Interface Language – The language to be used on the customer self-care web interface. TIP: You can expand the DID provisioning network and boost sales by allowing your subresellers to provision DID numbers. Please refer to the How To… section for more information about subreseller DID provisioning.